It was a gorgeous early morning, sunny and 50s, the Little Bemidji Lake is calm with fog rising from the lake. Loons are still sleeping. Temperature is warming up, the breeze has woken up the lake by stretching its calm nature. Riders after Headwaters 100 race are pumped up for the double header 2nd day race, the Laurentian Divide Challenge 20k mt. bike race/10k tour. A few thought the Yoga is a way of waking up their bodies in the secluded northern woods, many dove directly into the lodge for a hot breakfast meal. Well, it turns out that this double header event is not just a race/tour, it is about supporting hundreds of kids who have suffered heart diseases. The race organizer promoted and put up this double header race/tour to raise funds to help these kids by donating all race registration proceeds to a non-profit organization who hosts hundreds of these kids at Camp Odayin for three weeks of each July -- free of charge to the kids. 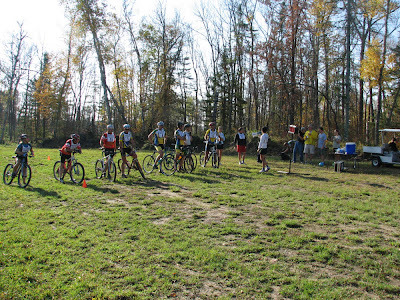 At 10am, the first Laurentian Divide Challenge race/tour was on its way. These following warriors took on the Challenge after the Headwaters 100, totally impressed many spectators and made this fundraising event a history of its own kind. Bernie and Neil did an excellent presentation on Camp Odayin and mission of TSH involving in RAAM 2007 and TSH Forever in RAAM 2008 and many years to come. Also, Paul Sarver and Carol Ruda also did a super presentation on RAGRABRI 2007. The presentations and bonfire stories generated a lot of supports for TSH Forever RAAM 2008 from LSCs and their families. CLICK HERE FOR THE FULL SLIDE SHOW! Thanks for shooting this Brendon! This was the second rider team exchange and the first night shift of our RAAM. I can only imagine what VMG or the Austrian team would say if they watch this..."we got beat by THESE guys???" Considering that we were a full rookie team and a full rookie crew, this ain't half bad. I gotta say though, that we got A LOT better real fast! But hey, this is RAAM. I also wanted to take this opportunity to thank our crew again (for the 1,000,000th time). You guys worked SO incredibly hard for us. Thanks another million! Great new video from Brendon! This one captures the emotion, nervous energy and anticipation at the 2007 RAAM start line. Come join over 3,000 cylists! The Minneapolis Bike Tour welcomes cycling enthusiasts, leisure cyclists seeking a challenge, families and friends to tour Minneapolis’ spectacular Grand Round Scenic Byway System. For the first time in decades, the Minneapolis Park and Recreation Board is closing parkways and roadways to all motorized traffic! In addition the tour will conclude with a post party, which will include exhibits, great entertainment, food and merchandise. Ride start between 7:30am and 9am for both 15 mile and 41 mile routes. This June (2008) Team Strong Heart will race in the epic Race Across America (RAAM) in support of Camp Odayin. This coast to coast race will see competitors racing around the clock to complete the 3000+ mile course form Oceanside, CA to Annapolis, MD. Billed as the "Worlds Toughest Bicycle Race" there is simply nothing else like it! Team Strong Heart was first the idea of Bernie Kaeferlein in 2006. Bernie said, I created Team Strong Heart out combination of passions for cycling and for helping people with Cardiovascular Disease. I've been a cyclist all my life and I've been involved in Cardiopulmonary Medicine for the past 14 years. I've worked in clinical research, cardiopulmonary rehabilitation and for two wonderful companies, Medical Graphics and Medtronic. Back in early 2006, I moved from talking about Race Across America (RAAM) with my riding buddies to actually working out the details. 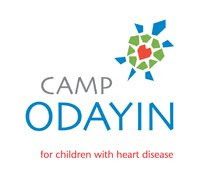 At the same time Cheryl Yano from the Heart Failure Society of America introduced me to Sara Meslow, the founder of Camp Odayin. I instantly fell in love with the Camp Odayin mission and wanted to help sponsor campers and raise awareness. Team Strong Heart was born. The name Team Strong Heart came to me easily through a double meaning of using strong athletic hearts through competition as well as through the strength of love and dedication to help hearts in need. It's been inspirational to have so many others join the Team Strong Heart mission. I had a hope that Team Strong Heart would inspire others and I am so thankful to see that hope become a reality! Team Strong Heart went on to become a successful reality finishing the coast to coast RAAM epic in 6 days, 15 hours, & 13 minutes. That earned them a spot on the podium finishing third overall (out of 16 in their class). The Team Strong Heart mission was realized and completed! or was it? On the very day Team Strong Heat crossed the finish line in Atlantic City, NJ back in June ('07) a phone call was made, "Hello. This is Amy, I want to make a team! I want to make Team Strong Heart Forever!" Amy Xu is on the phone and states she wants to carry on what Bernie started! She wants to put together a Team Strong Heart for 2008. The next chapter begins!! 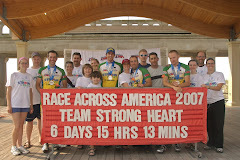 Team Strong Heart has now been entered into the 2008 RAAM race as the rededicated Team Strong Heart Forever. The 2008 team not only includes a new 4-person mixed team, but a second team, a soloist! Tim Case (returning team member of TSH07). These five riders and their support crews will once again take on the challenge to fulfill the Team Strong Heart mission and take on the 2008 Race Across America. The success of Team Strong Heart is really measured by the support of others. Real success does not happen by crossing the finish line, but by the gracious support of those who contribute to the Team Strong Heart mission. Corporate and individual donations are key! Help make Team Strong Heart Forever a success and the real winners will be the campers at Camp Odayin. Support Team Strong Heart Forever and we, the crew and race team, promise to give it all as we take on the epic challenge of the 2008 RAAM. Amy Xu Announces Team Strong Heart Forever! Amy Xu has announced that she is forming a 4 person mixed team to race in the 2008 Race Across America and is racing under the name Team Strong Heart Forever. During our preparation, race and after, Amy has really been on fire with immense drive and passion! "I officially signed up the 2008 Race Across AMerica (RAAM), a 4-rider team, TEAM STRONG HEART Forever, on August 5, 2007. I had this desire starting from back in April 2007. I have been very fortunate to follow the news and progress of the 2007 RAAM and the members of the TSH, Bernie, Neil, Tim, and Greg. They have been inspirational and continue to help the 2008 TSH's preparation. Currently we are in a preliminary planning phase, e.g. forming a team, preliminary talking with sponsors, gathering more information, etc. The TEAM STRONG HEART Forever mission is to make this event last as long as the RAAM lasts or forever while raising awareness of CAMP ODAYIN as well as honoring individuals' passion for Silent Sports and team work for a life-time journey. The 2008 TSH Forever's goal is to form a 4-person team (mix) with 2-3 alternates and a crew of 10-12. I am very grateful to have the 2007 RAAM TSH members' share their energy, experience, and provide their support. I also want to thank clubs and members, particularly from Loons State Cyclists, to support the 2008 TSH Forever team in this venture." Keep 'em spinning Amy! We're pulling for you!